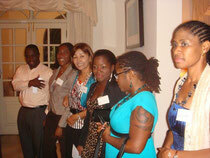 There was Jet Returnee's reception at Japanese ambassador's residence 2 days ago. Jamaica JET AA president, Shawn Aarons and former president, Kay Dunkley shared information, networking and promorting of JET. Recent returnee shared their great experience. Their face brightened with confidence. I believe they had a wonderful oppotunity in Japan.